A great find... 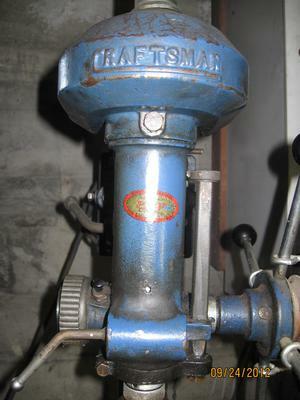 This is a vintage 1940's Craftsman Drill Press - Bench model. It's model No. 101.03622. It's in great condition and works great. great. I just bought one of these in Columbus, Ohio Sunday at a yard sale of all places for $50.00 without a motor. I have one, so that was no big deal. It doesn't have the expensive vise on it. That looks worth more that the drill press. This thing is built like a tank! 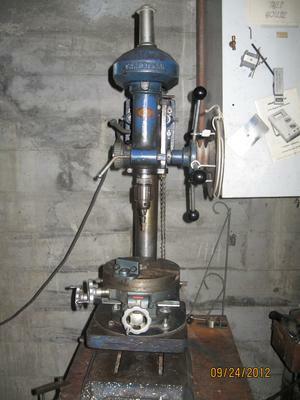 I have the same drill press and the 8" table saw to accompany it. Both were given to me by my dad. He bought both new in 1940. The table saw needs some work, but the drill press works like a champ.